Running Out of Room? Need more room? A larger family room? Maybe extra space in your kitchen? How about a bed and bath remodel? Most houses contain a suprising amount of space that can be altered or adapted to fit your family's needs. Room additions are common home improvement. People add on to their houses when they need more space but don't want, or are not able, to move. Some people build room additions to gain the benefit of space they want, whether they need it or not. In addition, homeowners built room additions to build equity in their houses. Room addition can be an excellent equity-building improvements, but they can also be high-risk investments. If you build the right type of addition, you can recover most of your cash investment. If increased equity or space is your goal, then adding a room addition to your home can increase your equity by thousand of dollars and give you that extra space you need. Whether you are contemplating a room addition out of necessity or desire, turning your design ideas into reality requires a good professional contractor. Bluestone can help turn your dreams into reality and assist you in determining the best solution for your "cramped" living space. We not only do great paintings, but great remodeling and room additions also. What types of room additions should you conside? Bedrooms, bathrooms, family rooms and dining rooms are some of the most common types of room additions. Not only are full room additions worth considering, but you might want to look at your options for expanding your kitchen for example. The benefit of a room addition is that with the right addition, built the right way at the right time, can add value to your home in an amount greater than your expense. You must be aware, however, that not all additions are profitable. Building a room addition to your home can make the house easier to sell. If you plan to sell your house, this can be a great advantage. 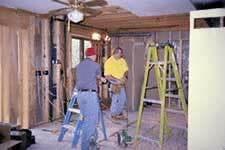 Whatever your needs are, our Chicago room addition remodeling contractors can help you in many ways. We create the additional space your home needs, for our goal is your satisfaction of a well done job- guaranteed! If you are looking for services other than handyman room Addition Chicago, please click "Home" link on top.